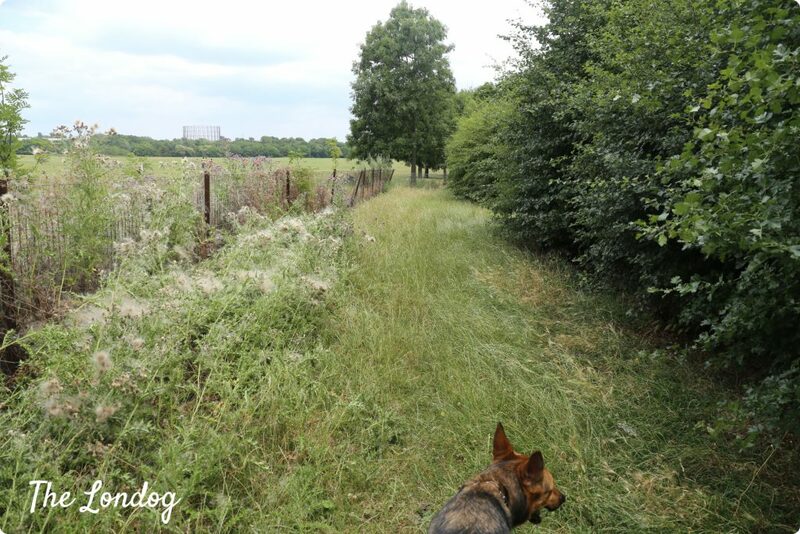 It has been a while since we published our last guide about fenced dog areas. 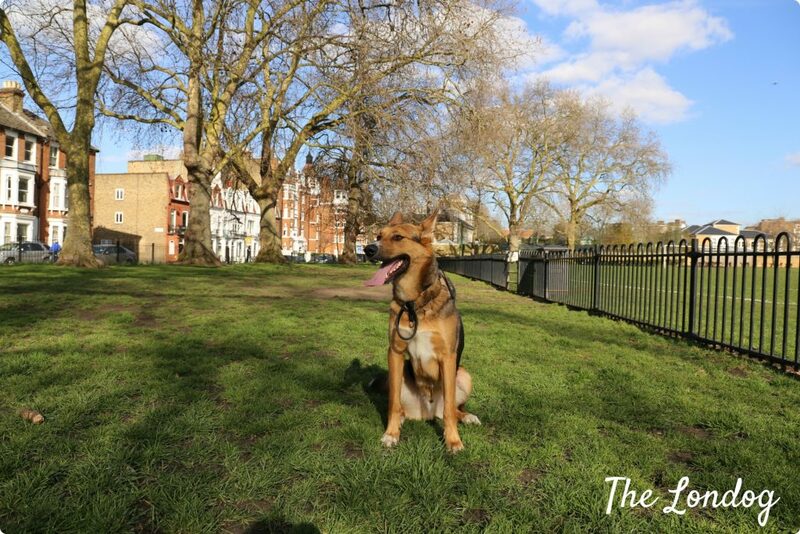 We previously covered dog parks located in South London, Central London and North London, so today we thought to provide you with our reviews and guide of the enclosed dog exercise areas in West London. Please note that this only includes dedicated dog areas: mapping out promiscuos use fenced parks is one of the next projects on our list after we finish the enclosed dog exercise areas project! As usual, we mapped out and personally visited each dog area, testing the same, taking photos and measuring fences. Please note that since it took us a while to go and visit them all, new issues may have arisen or improvements may have been made to the areas in the meantime. Please feel free to get in touch and flag any changes you may discover in occasion of your own visit! One last thing before leaving you to the reviews: remember that the survival of fenced dog areas depends on us, dog owners! 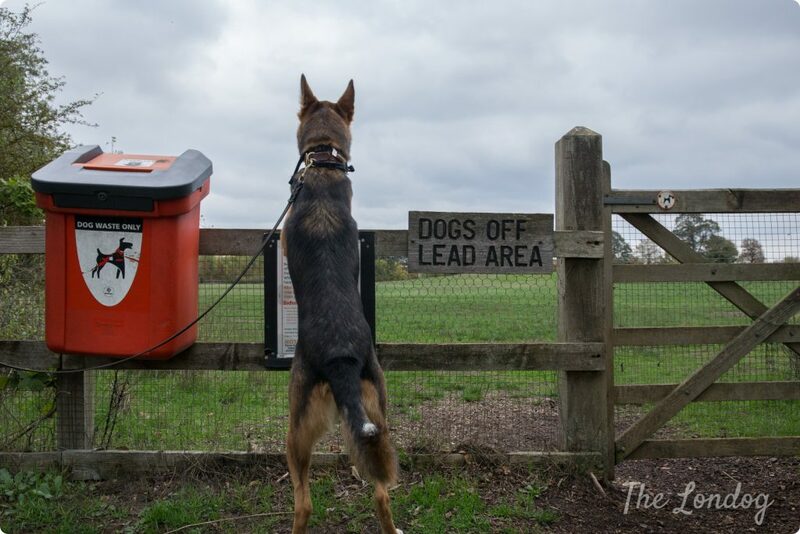 One of the reasons for their removal is often unpicked dog mess: please help the community and consider to pick up also other dogs’ poo if you spot it! 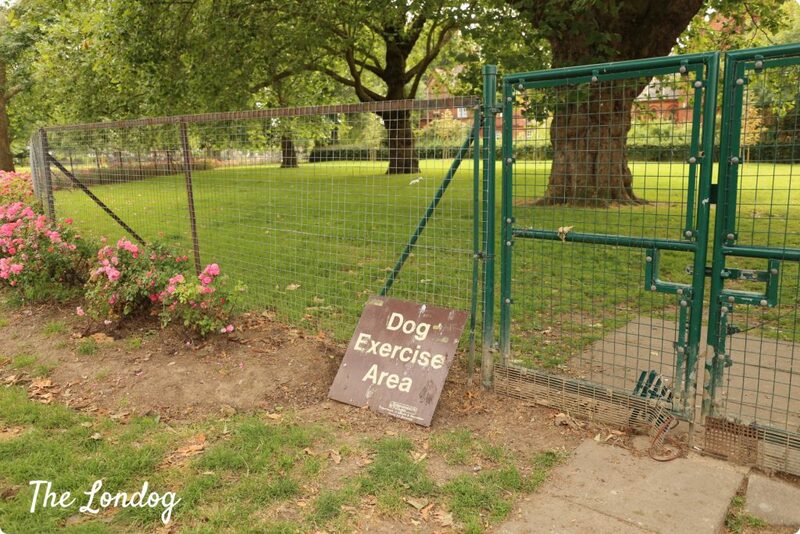 This is really a little effort that will allow you to continue enjoying a safe exercise space for your dog and do good to all park users. 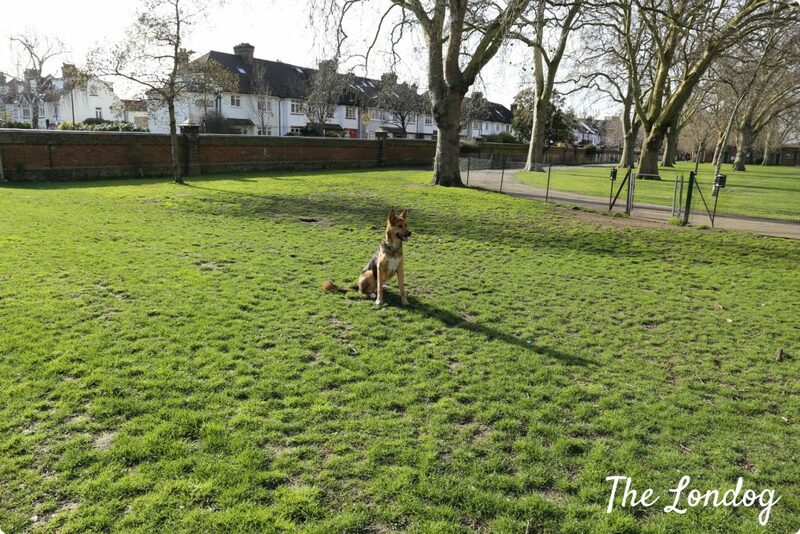 We really love South Park’s dog exercise area and already wrote about it in one of our first dog parks’ reviews. You can find our full review in the post linked below. 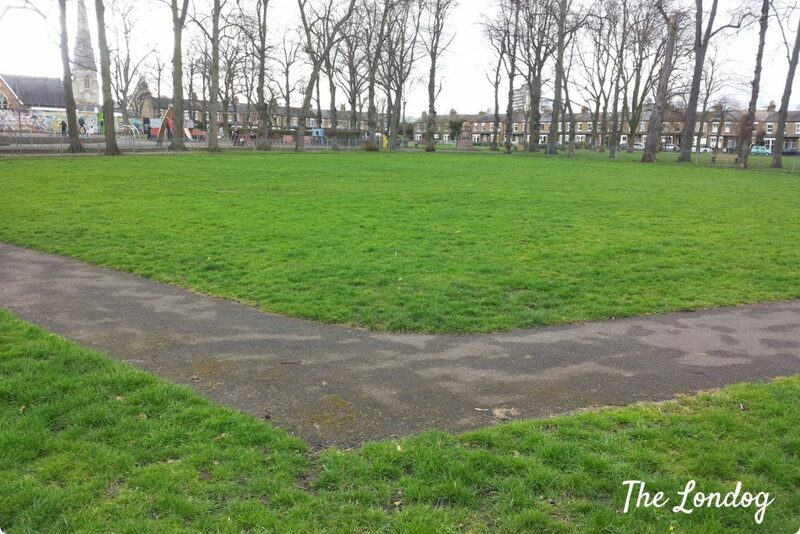 Eel Brook Common hosts a small/medium sized dog area of L shape. This has a metal railings fence all around it, about 90 cm high (approx. 35.43 inches) on the side with the Common, with space between bars of 13-14cm circa (approx. 5.12-5.51 inches). Such low fence makes the area not ideal for large dogs who could easily jump over the fence. On the border with the street, the fence reaches 110 cm (approx 43.31 inches). Finally, the internal part of the L shaped area borders with a tennis court and there is a higher stock fence to divide them. The dog exercise area has 2 gates, one of which is locked. The usable gate overlooks a concrete path and its lock is broken. The dog area has a lawn, few trees and a stone pavement at the entrance. In the corner with the street there are some bushes. At the time of our visit we found the dog area fairly clean. The dog park does not have any benches nor waste bins, but there are some just outside; there is no sign indicating that this is a dedicated dog area. 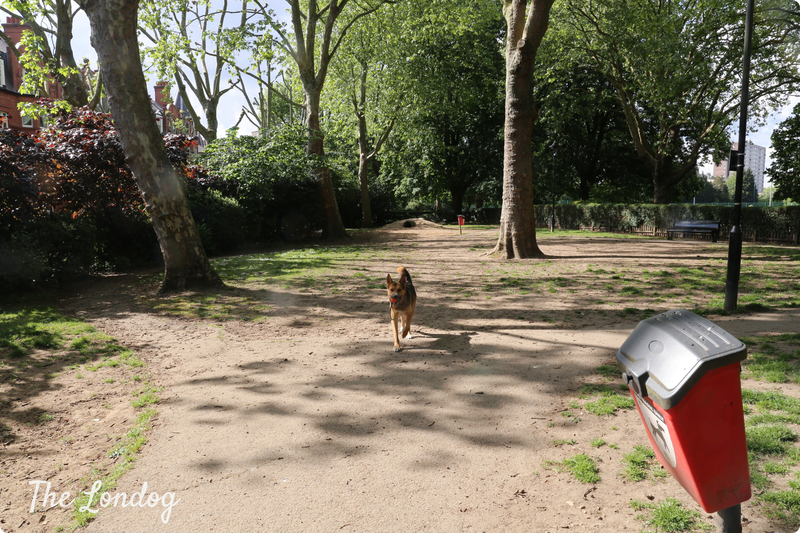 We later discovered that there is another dog exercise area in Eel Brook Common: we haven’t visited it yet, but it is on our list, so we will go and visit it next and let you know! 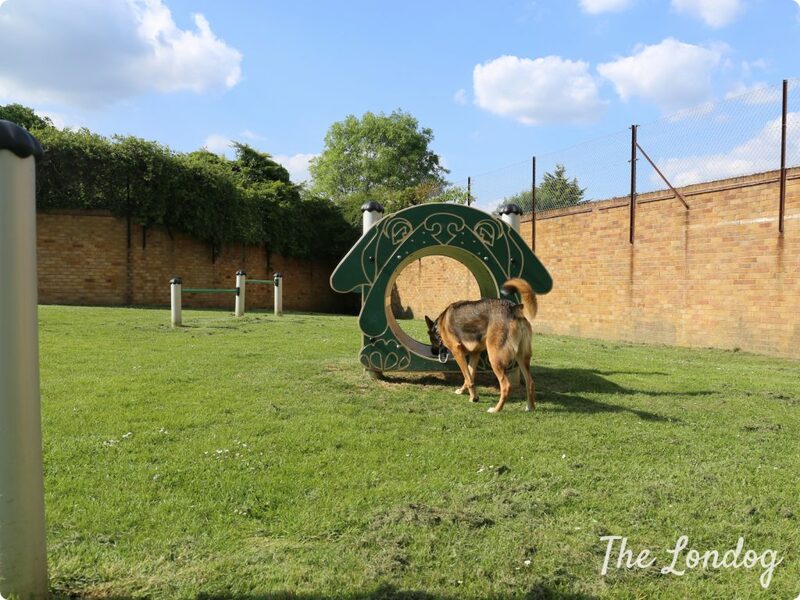 You can find our full review of Hurlingham Park’s large dog exercise area in the post linked below. Bishop’s Park hosts a large dog area of rectangular shape. 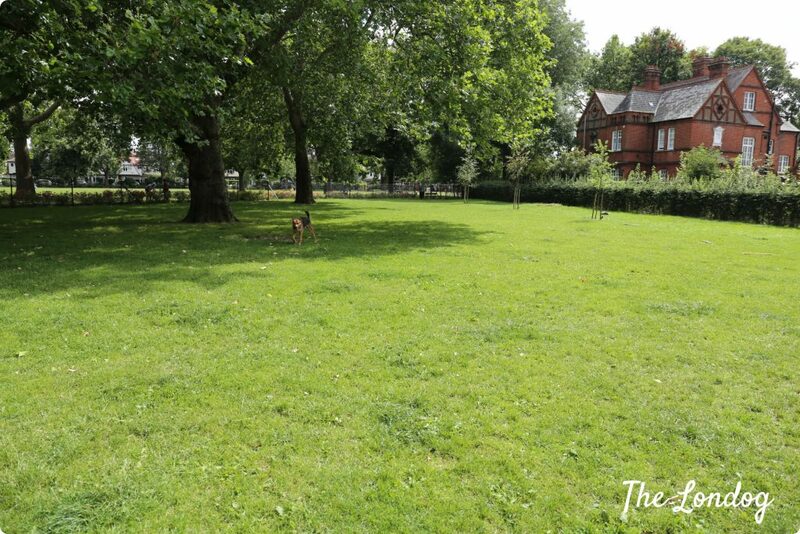 Located in Moat Gardens, just off Fulham Palace Road, the area is enclosed by a fence circa 97 cm high (approx. 38.19 inches), with space between bars of 10 cm (approx 3.93 inches), which does not make it totally safe for larger dogs. One of the long sides borders with some allotments and there is a higher stock fence to divide them. The area has 3 gates, all located on the long side of the area. There is a bench and a waste bin. 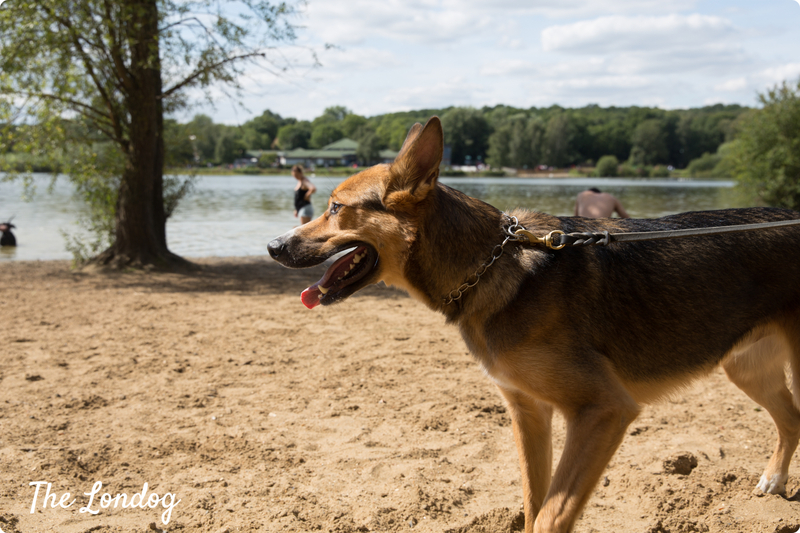 Each time we visited the area, Argo found dog friends to play and have a good run with. The closest tube station is Putney Bridge (District line). 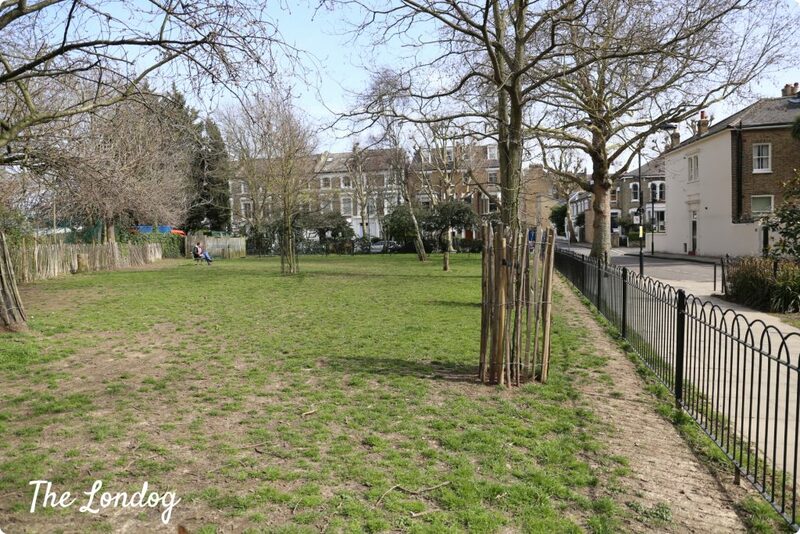 Lillie Road Recreation Ground’s dog exercise area is located in the south part of the Ground (the closest tube station is Hammersmith, which is a 15/20 minutes walk far). 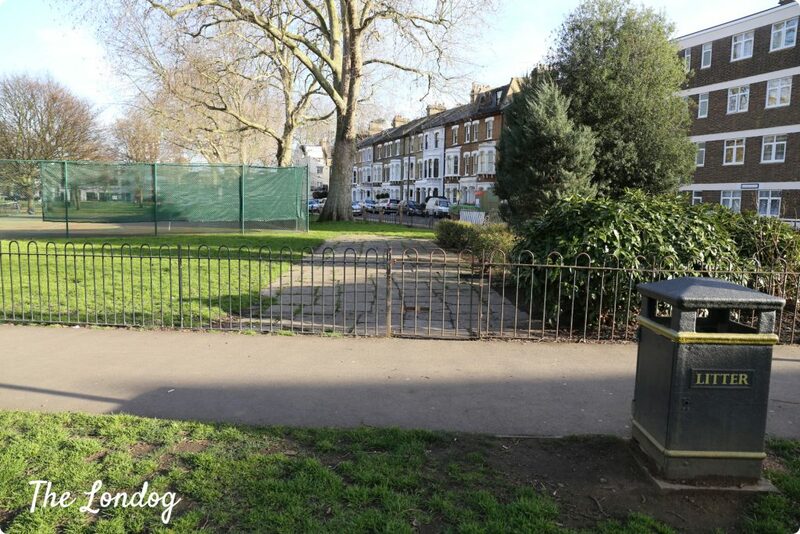 It is a large dog area which develops in lenght and borders with Fulham Palace Road Cemetery on one side. On three sides, the area has a fence 1 metre high, with space between bars of 8 cm (approx. 3.15 inches). I consider 1 metre (approx. 39.37 inches) too low for a large dog (Argo can easily jump over that height), so I would recommend being careful with big dogs. On the other long side it borders with the cemetery and there is a high metal bar fence. The area can become very muddy in Winter, obviously a downside, but for the rest we found it quite clean and well maintained. There are no benches nor bins in the dog area, but you can find them right outside. The area has 3 gates (two near the short ends) and one in the middle on the long side. 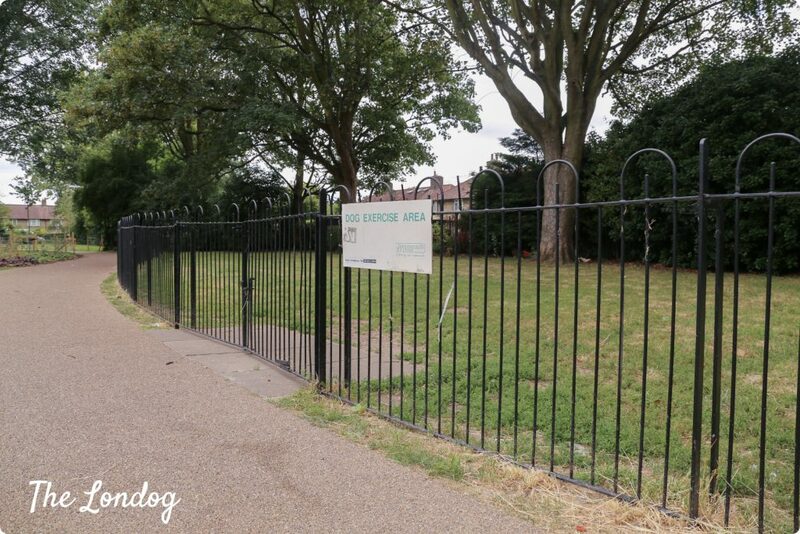 When inside the dog area, you may not be able to check on the gate near Fulham Palace Road entrance, because it is hidden by some bushes. The locks work fine. On Gwendwr Road there is a medium-sized dog area. The dog park has one only gate and a fence 121 cm high (approx. 47.64 inches) on the side with the road and nearby green space, with space between bars of 10.5/11 cm (approx. 4.13-4.33 inches); in addition, in the lower part of the fence there is a metal net, which adds an extra safety layer for small dogs. However there are some parts where this is not present. The fence overlooking busy Cromwell Road is 152 cm high (approx. 59.84 inches). The gate’s lock does not work but you can use some metal bars at the bottom to keep it shut. In the area there is a lawn and some trees, as well as a bench and a waste bin. However we found dog mess everywhere and in general the area is not very clean. Such a pity, it could be nice if better maintained. The closest tube station is West Kensington, on the south side of Cromwell Road. 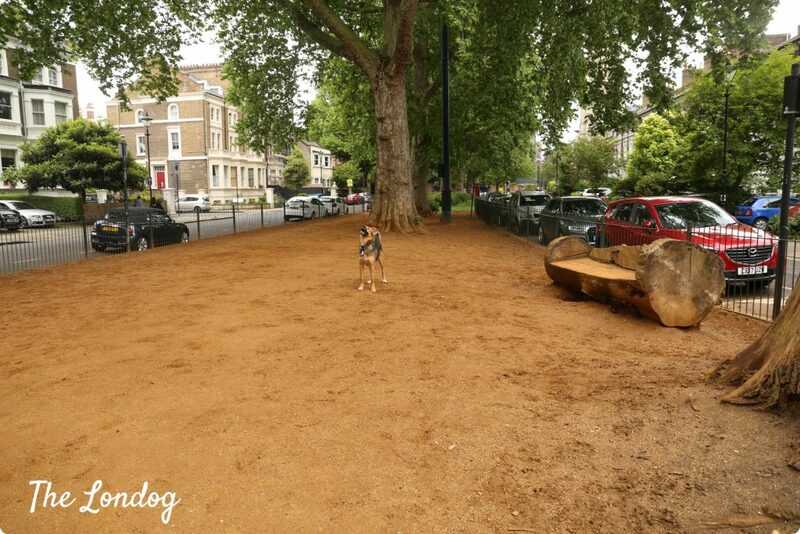 In Brook Green you can find a small/medium-sized dog area. It has no grass, but red earth on the ground. There are 3 big trees and the area is equipped with a dog waste bin, a general bin, and two benches, one of which made out of a log. The fence enclosing the area is 120 cm high (approx. 47.24 inches), with space between bars of 10.5 cm (approx. 4.13 inches). The dog area has two gates, on opposite sides (short sides). At the time of our visit we found it clean and well maintained. 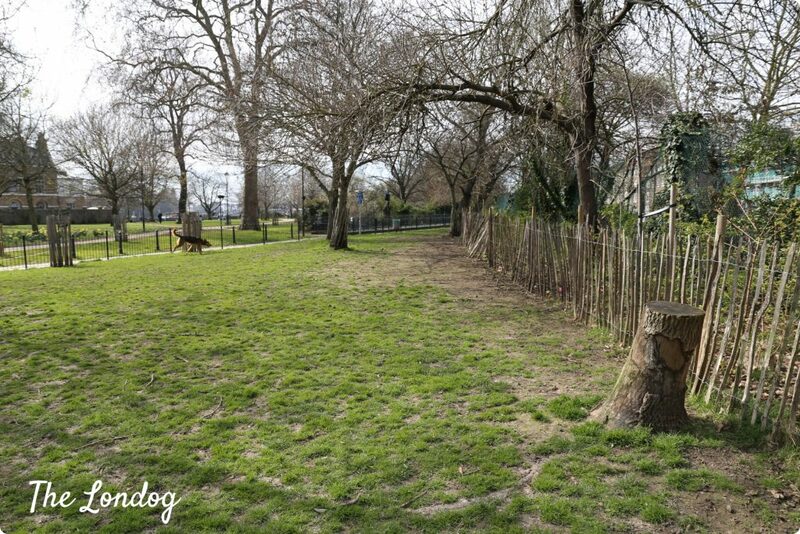 Just off the Thames Path, close to Hammersmith Bridge, there is an enclosed dog park. The closest tube station is Hammersmith (District, Piccadilly, Hammersmith & City lines). The fence on the border with the gardens is about 1 metre high (approx. 39.37 inches), while on the other side there is a wood fence that separates the area from a land strip with planted bushes, which has a high higher stock fence behind. It is equipped with a bench and two bins. The wooden fence is not perfectly maintained (you can find some broken parts). In some parts of the metal fence there are gaps underneath, something to watch out for small dogs. Review and photos coming soon! 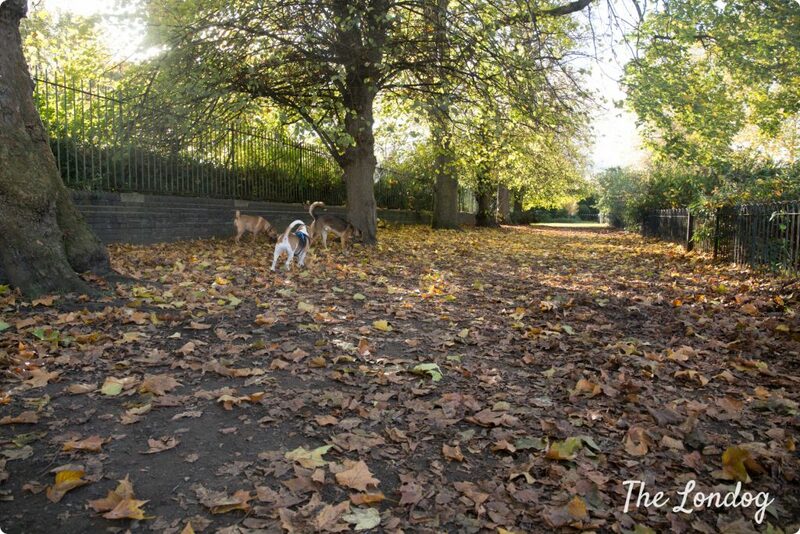 Ravenscourt Park hosts not one but three dog exercise areas! 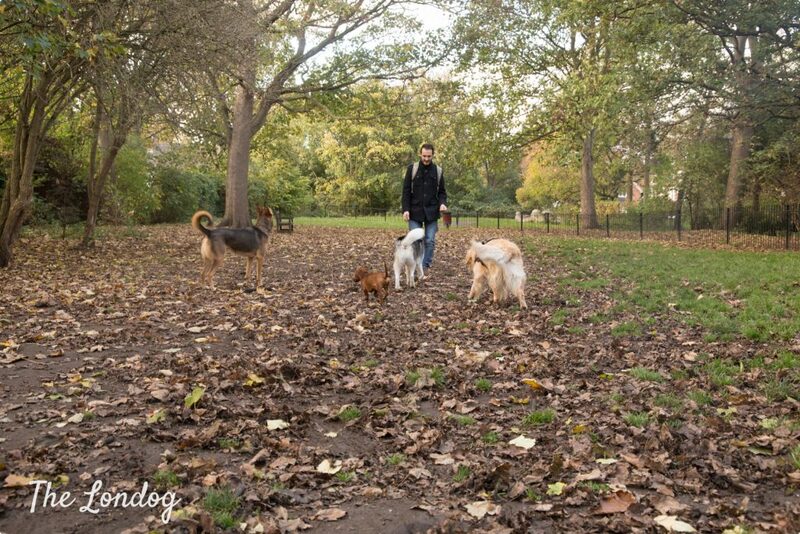 It is quite thoughtful that there you can find dog exercise areas, exercise your dog off-leash in the common parts of the park and there are also dog-free fenced areas where people who are not keen to interact with dogs can do picnics, so it basically make everybody happy. The closest tube station is Ravenscourt Park (District line). Two of the dog areas are located in the North-West part of the Park, and a smaller one is located in the South-West part of the Park. This was one of the first we visited and we hadn’t taken measures, so some better photos, measures and review will be coming as soon as we go and visit it again! Wormholt Park has a small/medium-sized dog area that develops in lenght. It has two gates, one of them is locked, while the other, which has a double door, works fine. The fence consists of metal railings approximately 110 cm high (approx. 43.31 inches). There is very little space under the fence, so this should make it safe for small dogs, and the space between bars is 7 cm circa (approx. 2.75 inches). There is a higher stock fence on the side with the residential area. The area has a lawn, trees on one side, and bushes at the ends. It would be a nice one if only there wasn’t so much unpicked dog mess all around and rubbish here and there (you can’t see it in these photos)! There are no bins nor benches inside the dog area. In Wormwood Scrubs you can find one of the worst London dog areas we ever visited. The dog area is located behind a parking lot and is awfully maintained: there is rubbish and unpicked dog mess everywere and you can choose between one side of the area (photo above) with no grass and debris or the one on the other side of the bushes with high grass (the pictures don’t make it justice: it’s worse than it looks). The area is divided in two parts by some bushes/trees, and you can’t see your dog when it goes on the other side. The access gate is hidden behind some bushes, so you can’t see if somebody is coming in either. Wendell Park has a very nice large dog area. Probably one of our favourites. 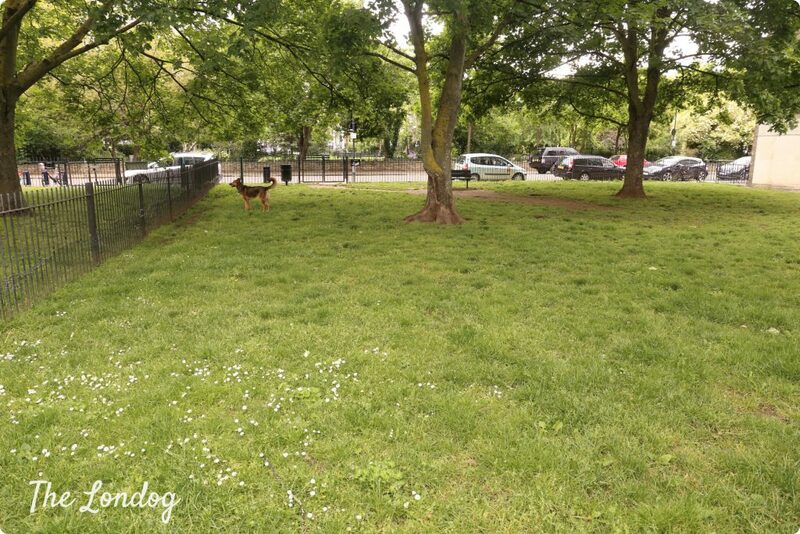 The area has a lawn with three big trees, and four newly planted ones and bushes on one side, so also in Summer you can find some shade for your dog. 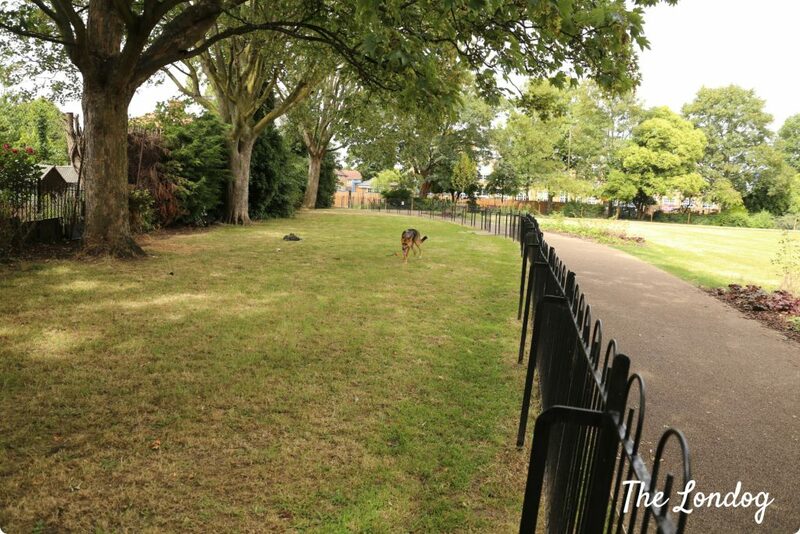 The dog area is enclosed by a stock fence on the side with the street that is more than 3 metres high (approx. 118 inches), while the fence with the rest of the park is 145cm high (approx. 57.09 inches), which is great for larger dogs. There are two gates working well, and the dog park is well maintained and clean. You can also find three benches and a bin close to one of the gates. 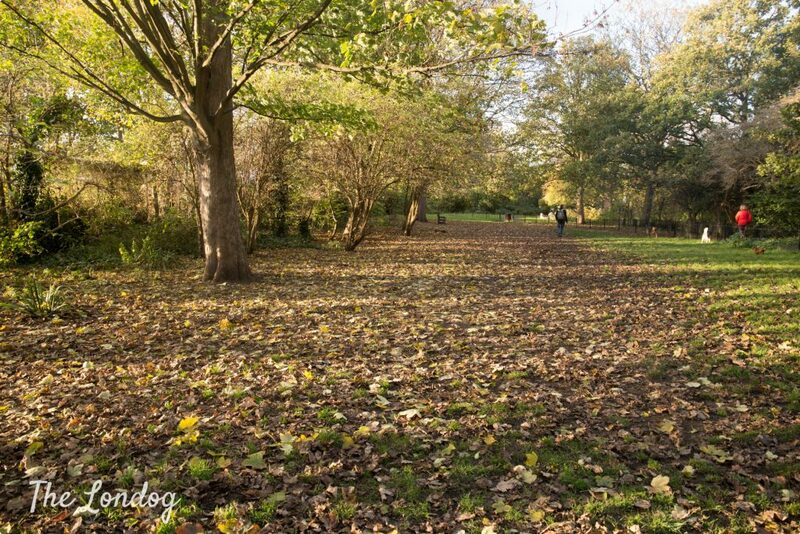 Close to the Thames Path near Kew Bridge you can find Strand on the Green Recreation gGround. 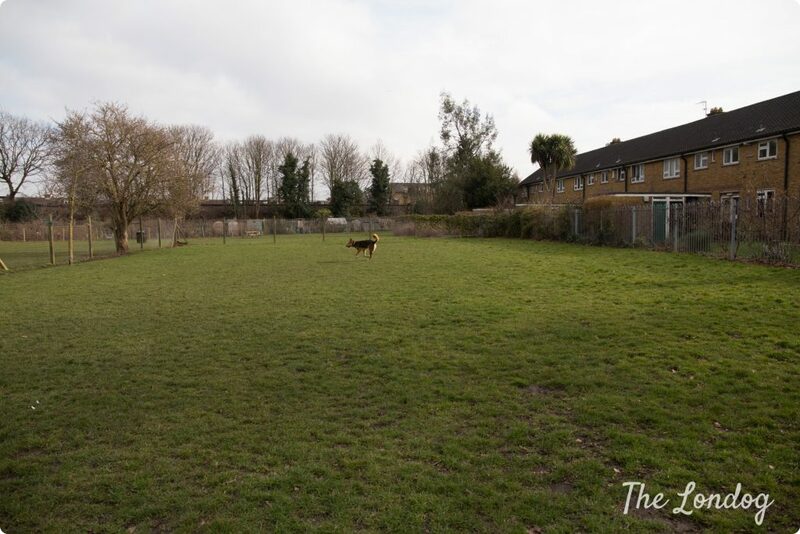 It hosts a medium-sized dog area that we very much liked (probably also because of its vicinity to the very pleasant Thames Walk and dog-friendly riverside pub The City Barge). The area is enclosed by a very high stock fence (with planted concrete poles) around 180 cm high (approx. 70.87 inches). On the side bordering with the residential area there is a metal railings fence around 185 cm high (approx. 72.83 inches), with a space of 10cm between bars, and 13cm underneath (approx. 5.12 inches). The area has a lawn with two small trees, a bench and a waste bin. There is only one gate, which lock works fine. The closest station is Kew Bridge. 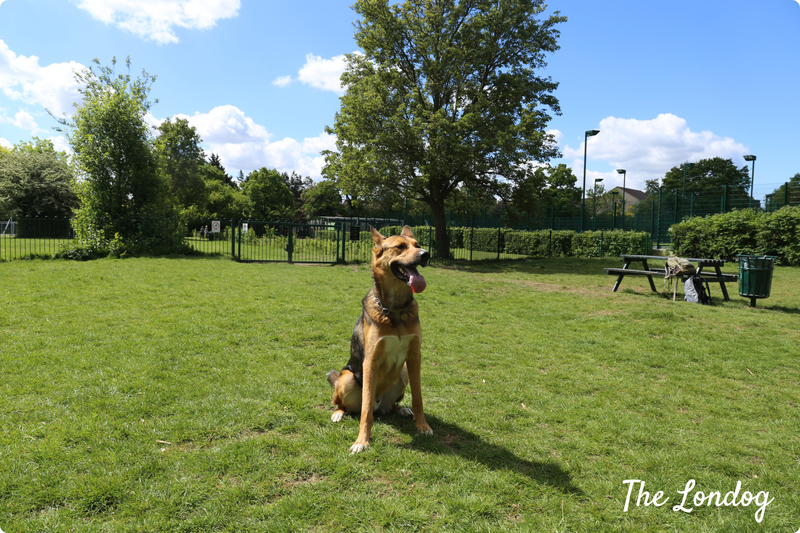 North Sheen Recreation Ground is a lovely place which has a very lovely medium/large-sized dog area. There is a bench, while bins can be found just outside the area. The closest train stations are Kew Gardens and North Sheen. Fences. 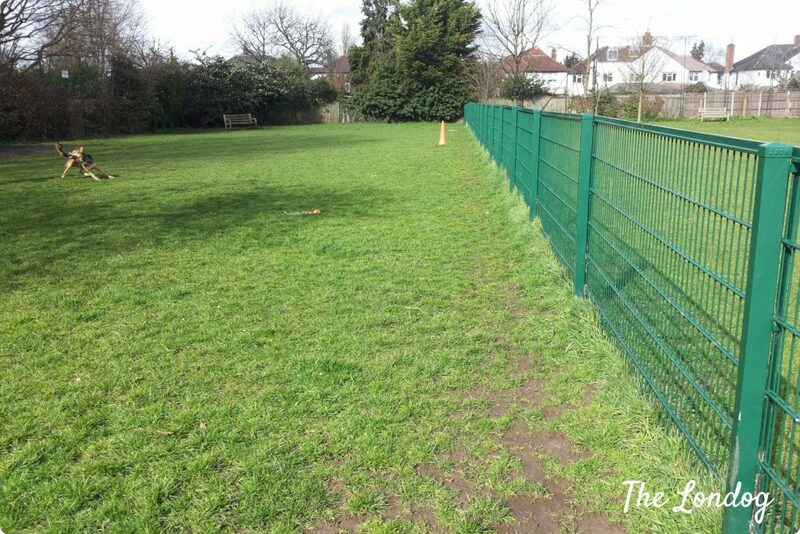 Two sides of the dog park are enclosed by a rigid metal fence 127/132 cm high (approx. 50-52 inches), while the other sides (on of which bordering with the residential area) is enclosed by a very high fence. The area has two gates, one on a short side and one on a long side. Under the gate there is a gap less than 7 cm wide (approx. 2.75 inches). Something to watch out for that we found at the time of our visit (but may have been fixed afterwards) is a hole in the ground in the back part of the dog area, probably dug by some fox, so please use extra care with small dogs who may decide to dive in and under. There is a sign requesting users of the dog area to occupy the same for maximum 20 minutes due to popularity of the same. Obviously, if there is nobody wishing to use it next you can stay longer. 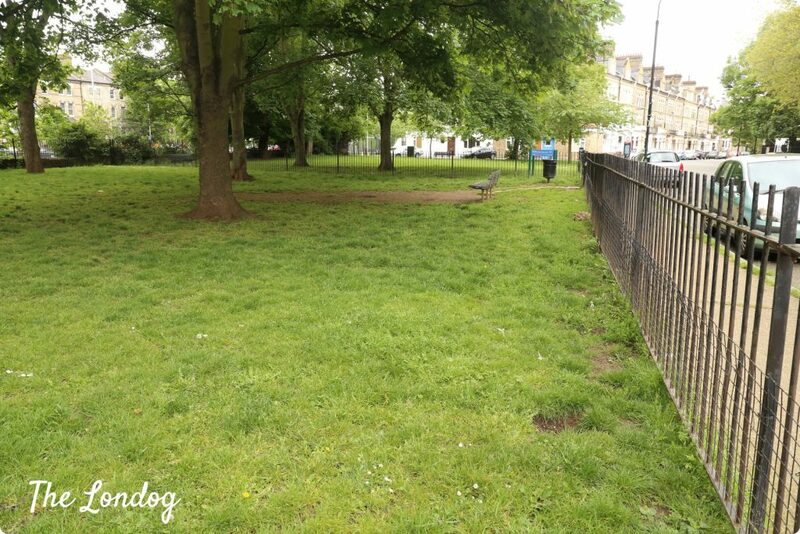 There is a large dog area in St Paul’s Recreation Ground. It has 3 entrance gates, 2 dog waste bins, 2 benches and some trees. Fences. The metal fence on two sides street and residential area is quite rusty and not well maintained (in some points there are some broken or deformed bars) and is about 110cm high (approx. 43.31 inches), with space between bars of 9 cm circa (approx. 3.54 inches), and has spikes on the top. 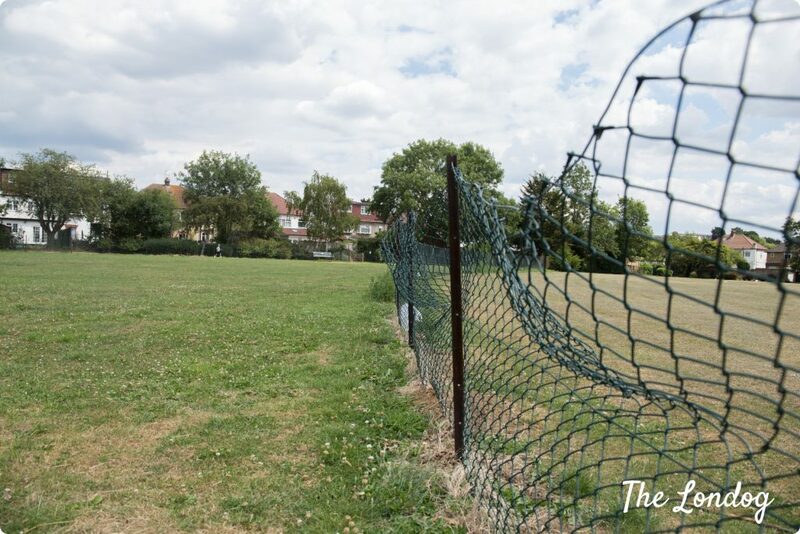 The fence enclosing the area on the other two sides consists of metal railings with round bars on top and is 110 cm high, with space between bars around 10 cm (approx. 3.93 inches). Wolf Fields hosts a large dog exercise area. 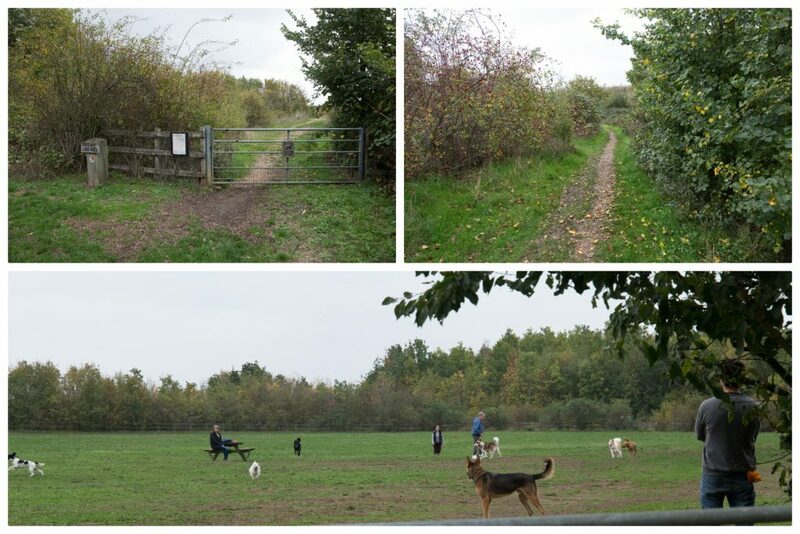 The dog park has two gates, one of which near the entrance of the Fields, under which there is a gap of circa 12 cm. The fence surrounding the area is 102/105cm high (approx. 40.16-41.34 inches) and consists in stock fence with wooden frame. In addition, there is a high metal bar fence and brick wall towards the street and a high wooden fence on the border with the with residential area. Waste bins and benches are located outside the dog area. We found the area was well maintained and clean and great for a good run. The closest train station is Southall. 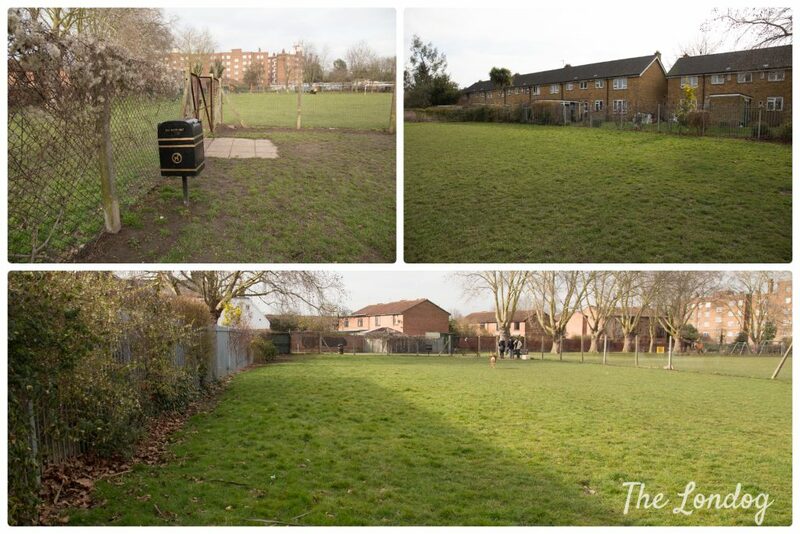 Oldfield Recreation Ground hosts a medium/large-sized dog area consisting in a lawn. The area has a bench, a waste bin and two gates on opposite parts of the area. It is enclosed by a stock fence circa 120cm high (approx. 47.24 inches), which is not very well maintained. There is a gap of 12cm circa under the west gate (approx. 4.72 inches), which is circa 100 cm high (approx. 39.37 inches). The closest tube station is Greenford (Central line). In Chase Green there is a small/medium-sized dog area called Bark Park, equipped with fun dog agility facilities, which include a tunnel, slalom, jumps and a frame. The dog park is very well maintained. The area’s external fence is about 99 cm high (approx. 38.98 inches), with space between bars of circa 9cm (approx. 3.54 inches). On the boder with the basketball pitch there is a high ridig metal fence about 2 meters high (approx. 78.74 inches), while there is a brick wall on the other two sides. 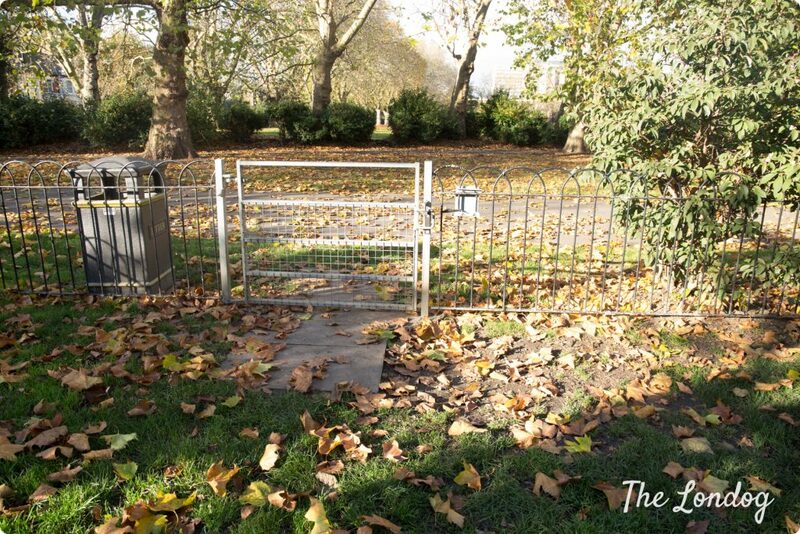 The dog area has only one gate, with a gap of 10cm underneath, and a space of 8 cm (approx. 3.15 inches) between the bars. There is one dog waste bin, a bench and a tree. In case you are interested in finding other public agility areas in London, we wrote about these in this blog post. The closest train station is Whitton. 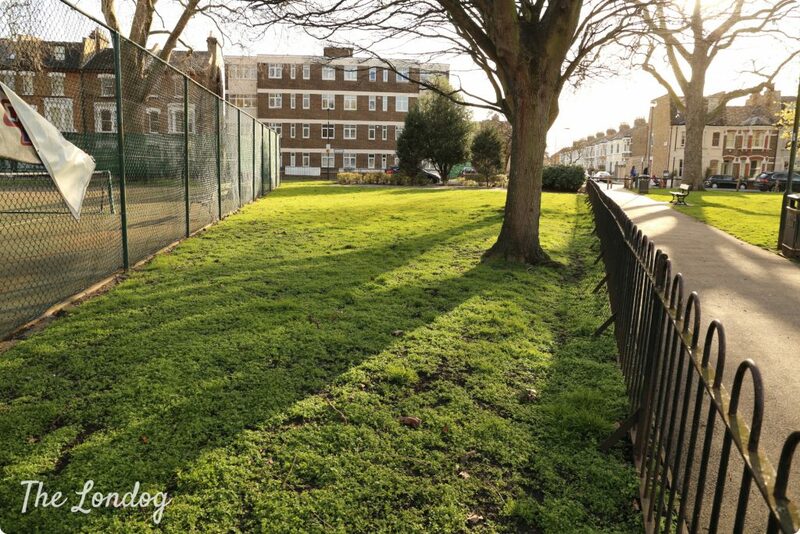 In Elm Road Recreation Ground you can find a medium/large dog area. On one side it borders with the residential area, while the other sides are enclosed by a metal bars fence 110-120cm high (approx. 43.31-47.24 inches), with space between bars of 12cm circa (approx. 4.72 inches). It has three gates. The area is equipped with 2 dog waste bins. Bedfont Lakes Country Park is a lovely park not far from Heathrow airport. 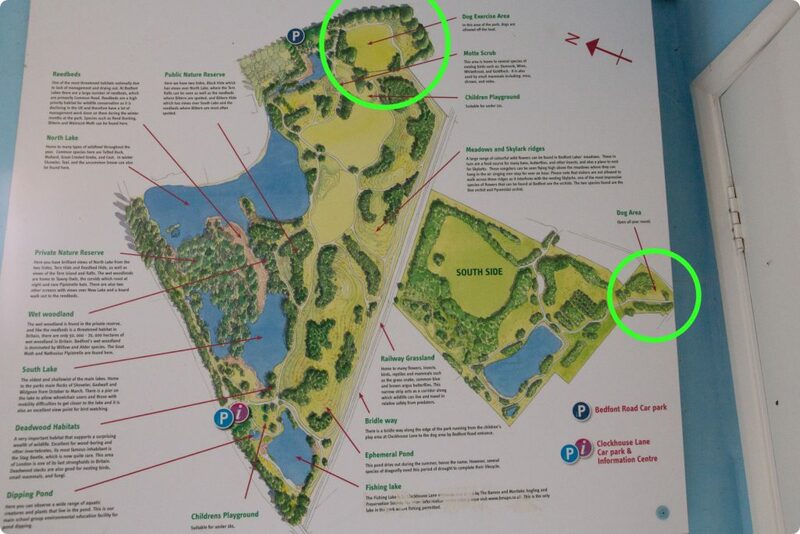 Dogs are required to stay on lead in the whole park, apart from the two dog areas (see map with circles highlighted at the bottom of the review) and there are some conservation areas within the park. 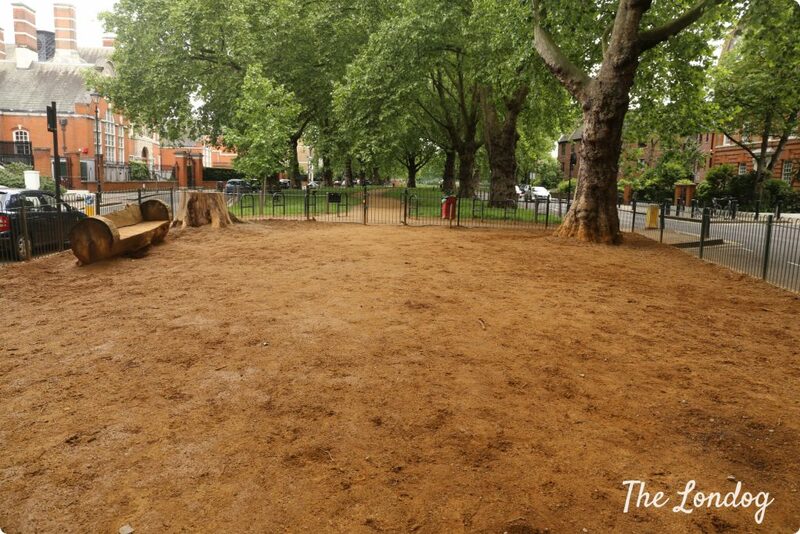 The dog exercise area is by far the largest we have ever visited in London and is simply huge. 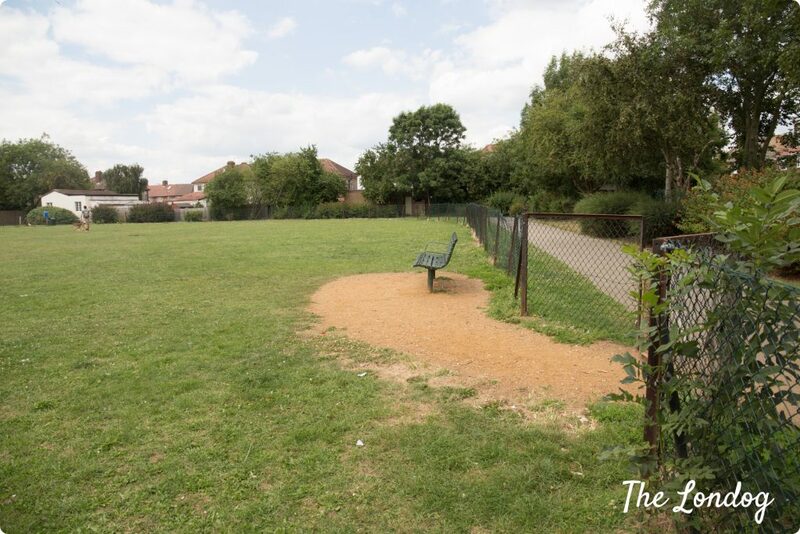 It is located in the North part of the park, near Bedfont Road (and there is a car park nearby). There are three gates, which you cannot see from one single point of observation, and locks work well. Please note that there is a gap under the fence (sorry I don’t have measures for it). The area has a little hill on a side and is fully enclosed by a wooden frame fence, fitted with metal stock fence, of an height of approx. 110cm (approx. 43.30 inches), but on a side of the dog area, which borders with a kennel, there is a higher fence. Being so huge and having in some parts brambles in front of the fence, it is difficult to say if there are any holes in any part of the fence, but from what we saw there was nothing. The dog exercise area has a picnic table, a bench and some dog waste bins. When we entered the dog area we were alone, but by the time we left there were other some 8 other dogs running around. The dog park is so huge that you have plenty of room to play with your dog without other dogs around anyway. We very much recommend a visit! 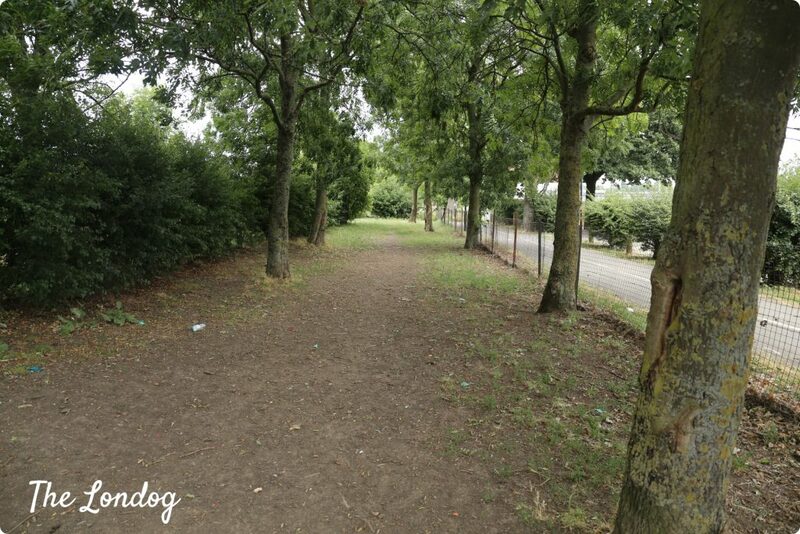 To reach the second dog aream in the South side of the park, we assume that you should walk on Bedfont Road and then find a way from there, because we tried on the other side and there was no crossing to get past the railway. We didn’t have time to explore this one because after the first one and our attempt to find a crossing to get to the South side it got late, so we would love to hear if you got the change to visit that one. 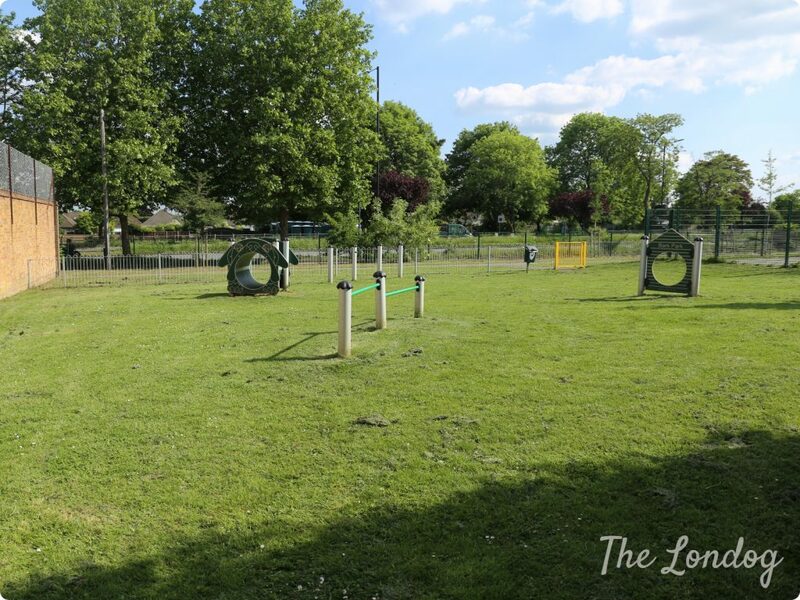 There is are car parks, and that is the best way to reach the park (and if you go by car, be aware that the dog exercise area can be accessed from Bedfont Road too). We did travel by train, catching the South Western railway from Waterloo station to Ashford station (note that your Oyster won’t get you there, so you’ll need a train ticket). 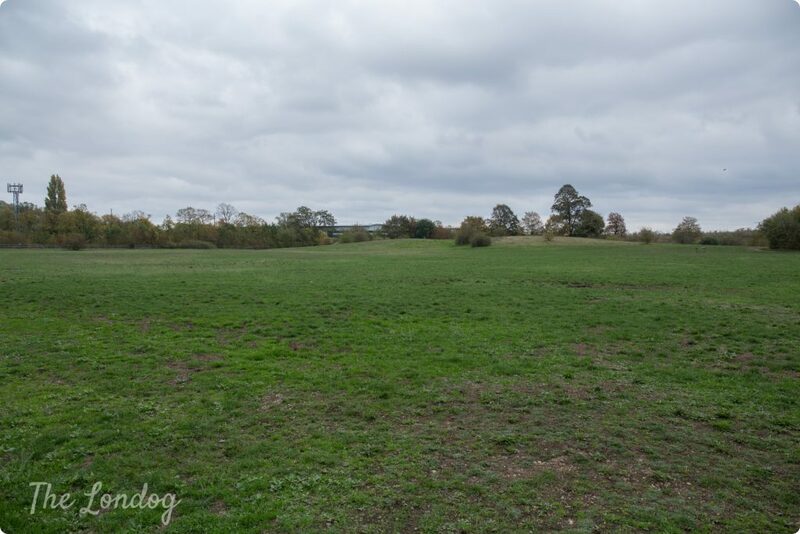 From Ashford station it is a 20ish minutes walk to Bedfont Lakes Country Park entrance on Clockhouse Lane. 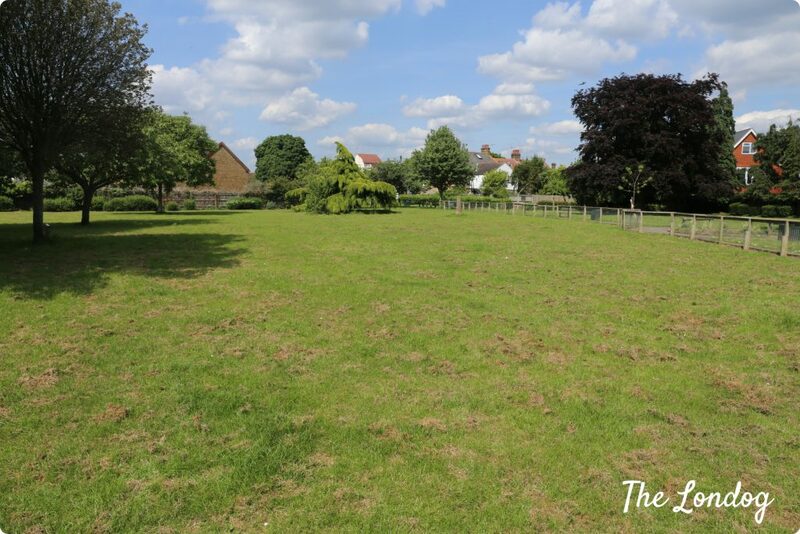 The first part of the walk is through a residential area; you will reach Ashford Recreation Ground, which is a not fully enclosed, but almost fully enclosed park which is very popular among dog walkers, so in case you can stop there for a bit; the last stretch to reach the park is quite dangerous, because you have to pass over a bridge which has no footpath and is on top of a hill, so you can’t really see the cars coming one way or the other and it is scary how much cars go fast on that road. I would therefore advise against going on foot, but if you have no choice than to walk there, please be extremely careful, wear hi-visibility clothes, keep your dog on the internal side. Brent Lea Recreation Ground, located just behind Syon Park in Brentford, does not have an official dog park, however, as it is fully enclosed and has only one gate, and dog owners and visitors, when we visited, seemed to be sensible about shutting the gate behind them, it can potentially be used as one. 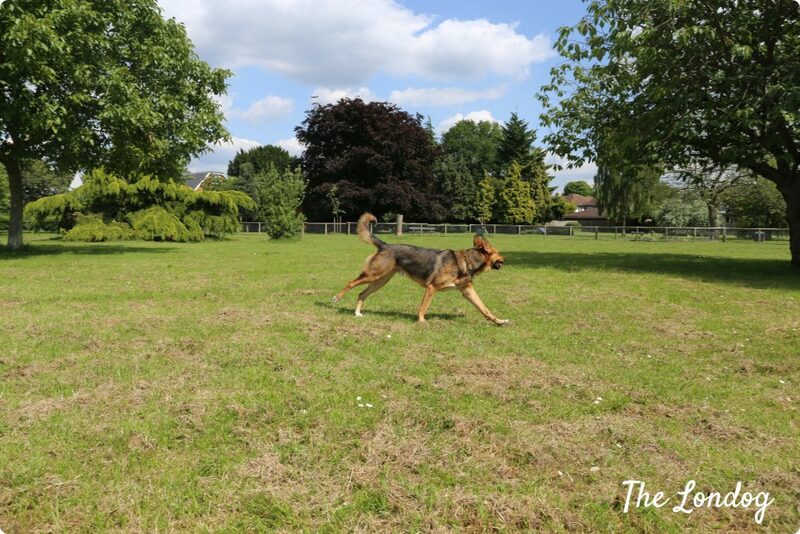 However, you need to consider that it also hosts there is a sports area with basketball pitch etc, which is not secluded, so if your dog doesn’t do well with people playing with balls/running/etc, best to check if there is anyone playing before letting him/her off. The dog park is fully enclosed, in some parts by high brick wall. The park is well maintained and we would definitely recommend a visit. Next PostPicturehouse Central's Dog-friendly Cinema Screenings: a Howling Success! I just wanted to say THANK YOU for writing this, it’s brilliant! So helpful given I now have a second dog with unreliable recall and some reactivity issues. Thank you. absolutely great to hear that this helps. Thank you for taking the time to write this message, it is very much appreciated! I can’t thank you enough for this list, I have two terriers, who despite confident recall can often decide today they don’t feel like coming when called if their off leash. One of my pups is a cairn/teacup yorkie mix, and I’ve ever go grateful you’ve listed gaps in/under the fences and gates. She’s very small and will slip through a hole bigger than 10cm and its vital to me to know this before I trek out to these parks so I’m not disappointed like I have in the past. I get told by dog owning friends “oh yeah, totally secure fence all the way around” only to miss out that my cat-sized dog could escape under the gate! And the poor pup has to remain on-lead whilst all the other doggies play off-lead! many thanks for your very kind comment! Love to be of help and I hope that your pup can enjoy some off-leash time in a safe area for her! Ditto!! Greyhounds by any chance? Great article. Many thanks for posting. I shall be visiting a few of these places to let my two rescue greyhounds run free!! This is brilliant, you are a life saver! I have a one year old border collie cross who loves to run and chase everything, which leaves me a nervous wreck in a unclosed park. Maria, this is fabulous to hear! Thank you very much for your comment. It is heartwarming when this information is of help for others! Great Blog! I have a miniature pinscher who has run away a few times so enclosed spaces are a must if I want to let her off the lead! I can also highly recommend Westerley Ware near Kew Green. Thank you, Louise! Glad it is helpful and will definitely check Westerley Ware. Are any of the fenced-in dog areas illuminated at night? Bark Park is the size of my bathroom. Thanks though.